The search for extraterrestrial life is one of the foundational missions of NASA that drives not only the SETI project but also motivates many of the missions to the planets.2 Carl Sagan was a principal investigator of the Voyager program, one of the most successful early missions to fly by the planets of the solar system. The mission was heavily influenced by his interest in finding extraterrestrial life. The Voyager 1 and Voyager 2 spacecraft are currently at the outer edge of the solar system and carry plaques on them with a message to be read by any extraterrestrials who might find them. The SETI radio telescope was brought out of mothballs because of the recent report that Kepler-22b, an earth-like planet, was found orbiting the “habitable zone” of the sun-like star KIC 10593626 about 600 light-years from earth.4,5,6 The position of the field of view in the sky is in the Cygnus-Lyra region just above the galactic plane looking down the Orion arm of our galaxy. It was reported to be the first planet with a measured radius to orbit the habitable zone of any star other than the sun. Attempts to find other worlds that originate and support life continue to turn up empty. Even if such a planet is found with the proper conditions to support life—a rocky surface, temperatures between the freezing and boiling points of water, moderate pressure, appropriate gases, and no dangerous radiation—it still needs life to originate in some way. The theory of evolution requires life to be generated from inanimate materials and then change into more complex forms. The origin of dumb life is only half the battle for evolutionists. The formation of intelligent life is the other half. But, if any life can be found elsewhere, evolutionists believe it will make the case that evolution produced life on earth. Up until now, no other planet with the proper conditions for life to exist has been found. But even if one is found, the theory of evolution has not been proven until life has also been found. Consequently, the SETI radio telescope will be trained on the planets the Kepler Project identifies as earth-like to increase the odds of detecting life. Isn’t it strange that astronomers are looking through their telescopes and searching the heavens for a signal containing information that indicates intelligent life exists somewhere beyond earth, while biologists are peering through their microscopes denying that the information they see in DNA molecules was placed there by an intelligent Creator? Many verses in the Bible tell us that God created man to exercise dominion over this beautiful planet. There is certainly something special about earth. Scripture also implies that God created life on earth alone, not anywhere else in the universe. One verse allows me to say with confidence that intelligent life will not be found elsewhere—“For Christ also hath once suffered for sins, the just for the unjust, that he might bring us to God, being put to death in the flesh, but quickened by the Spirit” (1 Peter 3:18). If Christ died only once here on earth, He could not have died for intelligent life on planets elsewhere. Otherwise, God would be unjust in saving only us on earth. Since God is just and righteous altogether, we on earth must be the only intelligent beings anywhere. SETI Search Resumes at Allen Telescope Array, Targeting New Planets. SETI Institute press release, December 5, 2011. Thomas, B. SETI Funding Linked to Belief in Evolution. ICR News. Posted on icr.org May 9, 2011. Personal communication. My conversations with Carl Sagan are discussed in Vardiman, L. 1995. Carl Sagan’s Pale Blue Dot. Acts & Facts. 24 (6). Klotz, I. Planet found orbiting habitable zone of sun-like star. Reuters, December 6, 2011. Borucki, W. J. et al. Kepler-22b: A 2.4 Earth-radius Planet in the Habitable Zone of a Sun-like Star. Astrophysical Journal, arXiv:1112.1640v1. Posted on arxiv.org December 7, 2011. Borucki, W. J. et al. 2008. 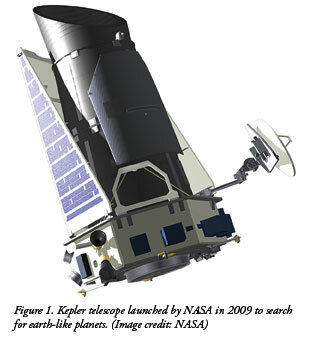 KEPLER: Search for Earth-Size Planets in the Habitable Zone. Proceedings of the International Astronomical Union. 4: 289-299. Thomas, B. 2010. Doubts Raised About the “Goldilocks” Planet. Acts & Facts. 39 (12): 17. Thomas, B. Did Astronomers Find an Evolving Planet? ICR News. Posted on icr.org November 3, 2011. Cite this article: Vardiman, L. 2012. SETI Radio Telescope Goes Back Online. Acts & Facts. 41 (2): 10-11.